As previously detailed, placing the mouse over a page or post title in the Edit Pages or Edit Posts screen gives you the option to Edit, Quick Edit, Delete or View the page or post. We have covered the Edit option in length so now it's time to look at the other options available. From this screen you can make quick changes to the page without editing the actual content of the page. On the left hand side you can change the title, the slug, the date of publication, the author and the visibility, that is whether or not the page is password protected or private. On the right hand side you can edit the page parent, the order of the page in the main menu, the template assigned to the page as well as allowing or disallowing comments and/or pings and finally the publication status of the page. You can cancel your changes at anytime by clicking on the Cancel button or you can save your changes by clicking on the Update Page button. From this screen you can make quick changes to the post without editing the actual content of the post. On the left hand side you can change the title, the slug, the date of publication, the author and the visibility, that is whether or not the post is password protected or private. 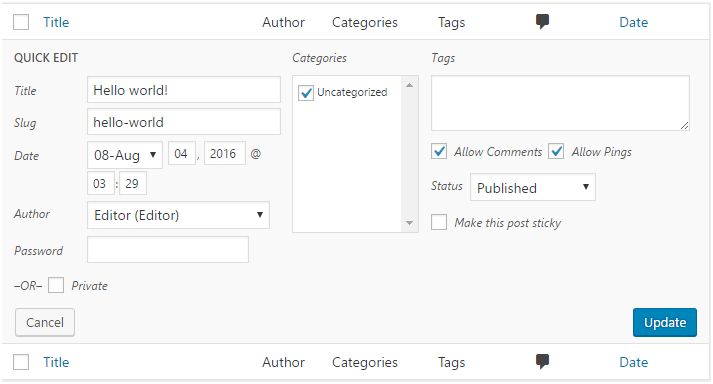 On the right hand side you can edit the categories the post belongs to, the tags assigned to the post as well as allowing or disallowing comments and/or pings and finally the publication status of the post including whether or not the post is sticky.